I rarely use the Medical Evidence Blog to discuss review articles, but today's NEJM has one that I can't pass up about Sedation and Delirium in the Intensive Care Unit. It is my opinion that we have gotten carried away by the torrent of articles, many in prominent journals, about delirium in the ICU and that while this is an important topic for research, it is extremely premature to try to translate the findings into practice, and moreover, that the approach to sedation suggested by the article is lacking in common sense. As chronicled in the accompanying perspective article by D.S. Jones, delirium has been around as long as ICUs have, and the longer you're there, the more likely you will become delirious. It's an exposure thing. Thus, until somebody reports the results of a trial of delirium treatment or prevention that has important and undeniable effects on clinically relevant outcomes, I will continue to approach delirium as I always have - by going to great lengths to get patients out of bed, off the vent, and out of the ICU as fast as I possibly can - because these things benefit all patients regardless of whether they have an impact on delirium. There's an old clinical saw that says something like "don't look for something or do a test to find something that you can't do anything about." And so let it be with delirium. I see no need to spend my time or my nurses' time performing CAM-ICU assessments (outside of a research setting) until somebody shows me convincingly that there's something I can do about it. Meanwhile, we will preoccupy ourselves with daily interruptions of sedation and analgesia, spontaneous breathing trials, extubations, and coaxing patients out of bed and working with physical therapy. One major premise of the review is that the treatment of pain is of paramount importance in the ICU. In support of this premise, the authors reference a 14-year-old review article in the American Journal of Critical Care (I did not heretofore know this journal existed) which is not available on-line as a full article, only as an abstract. Rather than turn this post into a literature review of pain in the ICU, let's apply some uncommon sense. Picture a patient, say 72 years old in the ICU with whatever medical disease you like (I'm purposefully excluding surgical and trauma diagnoses, because those are probably different animals). Say he has pneumonia or sepsis of urinary origin. Should we assume that he has pain? He does not appear to be in pain (respiratory distress is another question) nor has he complained of it. (Readers of my other blog Status Iatrogenicus know that I'm skeptical of pain rating scales.) This patient may be in the ICU because of precarious physiology or just because of demand elasticity of ICU beds (elasticity of demand also means that ICU populations may be fluid populations which pose difficulty for study, whose composition depends on factors external to the patients and their illness). So just as "ICU residence does not critical illness make," so also "ICU residence does not pain create." His pain has to do with his medical condition, not where it happens to be treated. And hopefully whatever pain he has is being adequately treated regardless of his residence at the time. If it is not, then we need a treatise on pain management in general, not that which occurs specifically in the ICU. There are many things that may be happening in the hospital that are making the patient uncomfortable: NPO status, frequent lab draws, an order for bedrest, etc. But I do not take it for granted that if this patient deteriorates and is intubated for mechanical ventilation that he suddenly has pain and needs analgesia. Other experiences bear this out - upon extubation, my patients are often preoccupied with things other than pain such as water for dry mouth, hunger, etc. Furthermore, consider another common and unpleasant medical procedure: colonoscopy. Would you want the gastroenterologist to continuously assess you for pain and give fentanyl, or would you rather have propofol and wake up after it was over? Figure 2 in the article tells us that indications for sedation include status epilepticus, intracranial hypertension, and severe respiratory failure with or without neuromuscular blockade. Otherwise, we are to treat pain and delirium (in what may be incessant loops). This algorithm completely ignores one of the major exigencies of caring for mechanically ventilated patients in the ICU. When I intubate a patient, a major goal is to make sure that they do not become agitated or aroused and pull that tube out. The nurse needs assurance that this will not happen too, so she can momentarily turn her back for charting or go get a medication or attend to another patient. Not all patients will need to be "sedated" - some will remain calm in spite of an endotracheal tube - but if they ARE agitated after intubation, I'm thinking about priorities and the priority is to keep that patient calm and safe. If an opioid will accomplish that, fine, but the most expeditious and effective route, in my experience, is to give some propofol. This exigency is also the reason that a majority of ICU patients wind up with physical restraints, for better or for worse. It is far from clear that the transition from spontaneous breathing to endotracheal intubation is an event that entails "pain." This is not to say that I am callously oblivious to pain and patient suffering - not by any means. But to assume that the simple presence of an endotracheal tube causes pain that needs to be the focus of treatment is untenable, and so are the suppositions that sedation alone has only very narrow indications and that a dose of fentanyl that achieves the goals of care is less deleterious than an infusion of propofol. But here is the ultimate test - suppose you yourself had to be intubated for a day. 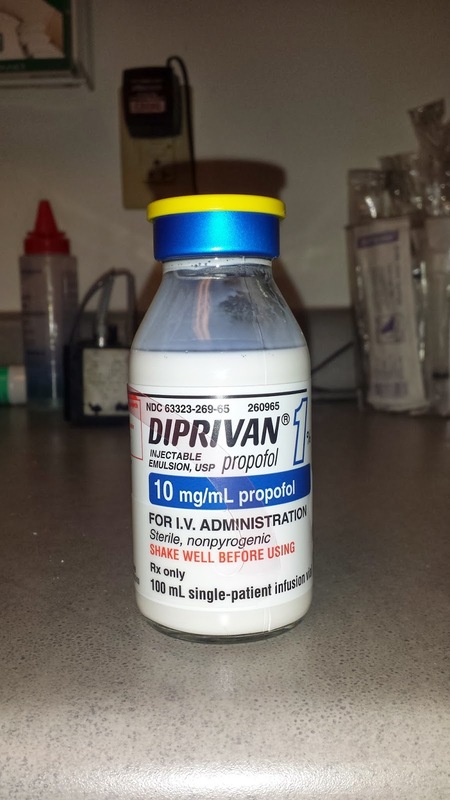 Would you rather I induce you, intubate you, and, as the Figure indicates, after the induction agent wears off "assess you for pain" and possibly enter that incessant loop of reassessments, or would you rather I give you a carefully titrated propofol infusion up front? I think you can infer what my choice would be if it were I. At least a quarter of the real estate of Figure 2 is devoted to delirium assessment and treatment even though the authors admit that "there is very little evidence to guide the management of established delirium." It seems that the study of delirium has made some folks delirious. Rather than worry about something we can't specifically treat, we need to be focused on reduction of exposure to the inciting environment through minimization of all sedation and analgesia with daily interruptions of ultra-short acting agents (PROPOFOL), aggressive mobilization, rapid deescalation of laboratory and radiographic testing and physiological monitoring that interfere with mobility, minimization of other noxious stimuli in the ICU (such as nocebo effects: see Death by 1000 Needlesticks), and expeditious extubations (unencumbered by admonitions to make sure the underlying disease has resolved, there is no fever, the patient is off pressors, and other nonsensical preconditions for extubation that are based on status quo and omission biases). Finally, as a sage mentor of mine once told me, "Scott, don't believe everything you read." I couldn't agree more with regards to delirium assessment and treatment! There is consistent evidence that ICU delirium is ASSOCIATED with poorer outcomes, but there is a lack of data showing CAUSATION or that delirium treatment modifies this risk. Association doesn't prove causation, and an onslaught of studies showing delirium being associated with poorer outcomes (after correcting for baseline imbalances with regression techniques) isn't convincing enough to warrant frequent CAM-ICU assessments. As you mention, even if a patient does have ICU delirium, there are no consistently proven therapies that reduce delirium AND improve patient outcomes. Delirium should absolutely be an area of research, but I don't view it as a "must have" for the daily ICU setting. You make the false assumption that all delirium assessments are related to "sedation". Delirium is often the canary in the coal mine for an impending event and can be a valuable warning sign. It is quite often simply a change in mentation that will herald an early sepsis, dvt, mi, etc. A task as simple as checking a CAM-ICU is not worthy of so much scorn. Do you need the CAM-ICU to know that a patient is delirious? The same argument could be made for daily labs or daily xrays. And I think we now know that those are not justified and may precipitate misadventures.